McKee`s, and now Sovereign (very recently), have Jeweling Waxes available to us. Mike Phillips has said he likes the McKee`s and uses it on his truck. As I jewel paint with Menzerna 3800 or Poorboys Professional using a black or blue pad, I think to myself that just about any extremely mild goo would achieve similar results. For example, I have "polished" a panel or two using Black Hole, said panels that were perfectly corrected and NOT in need of glaze, and the end result was more gloss. But, there were no nooks and crannies for the resins in the glaze to lodge themselves, so what DID the Black Hole do? My thought is that it simply provided safe non-abrasive lubrication for the PAD to jewel the paint. Ah ha! What about Jeweling WAX??? Kind of an AIO for cars that don`t need correction? Is that what it is? Since I`m intrigued and might want to try this fancy Jeweling Wax idea, I have to wonder... since I`m a wax-over-sealant guy, will these jeweling waxes defeat the sealant? Or, are they meant to be the sole LSP? My experience with just about all waxes I have worked with is that some tend to mute the gloss and not leave it as sharp as it was before the product application..
Or, another marketing niche to fill, because you know we all need more things to buy.. I never use the stuff, unless a Client tells me to put it on their Baby..
Have never gotten past the fact that wax attracts dirt, and I don`t want more dirt on anything... Must be the DetailerOCD kicking in??? Sorry, I am not helping.. They claim to have ultra fine abrasive in them as you said sf3800 or rupes white ultra fine polish kind of abrasive. And that it`s a quality liquid wax in it. I have just read through Mike Phillips write up on pinnacle jeweling wax. The thought that comes to mind is the level of cut he was able to get. Cause is it deminishing abrasive in it the working time with 8-10 passes per sections he did suggest that the pad took over the cut in the end of the buffing time. Or it`s a non deminishing abrasive in it and that`s how you can get the level of cut he was able to get. The clearcoat was maybe very soft too and maybe a combo of it. He did a 2 step polishing with a cutting foam pad and a finishing foam pad. Maybe not what you would normaly do with a jeweling wax since the price of it. Something I think is different between an AIO and a JW is that the first has chemical cleaners in it. So wondering if it`s a good thing to use it as a one step product. Or it will excell when use a compound/polish and then jeweling it in the last step. But it maybe will be perfect for some to use. But, there were no nooks and crannies for the resins in the glaze to lodge themselves, so what DID the Black Hole do? While I`m a wax guy, I must admit it attracts dust. Back when I was a Collinite fanatic (well, still am, but I`m fanatical about 37 waxes now rather than 1), my car with 915 on it would visibly attract more dust than a friend`s car that had Menz Power Lock on it. However, my car LOOKED better, even though both cars were finished down really well (by me). So I guess I`m saying, "the look is worth it" insofar as using waxes. But... are these new jeweling waxes made from carnauba? I dunno. Yeah, I think that`s what was happening when I "jeweled" with Black Hole. I was really just glazing, but I WAS doing it a very low speed for LONG time, so I`ll give myself SOME credit for "jeweling" because it makes me feel "learned" like some-a you guys. Thanks for the awesome response Ray. Are you in Florida? That`s a good Merlin shot on that beautiful Benz. I can see the use for a jeweling wax if you have a garage queen or a museum piece that rarely sees the light of day. I’ll stick with Essence and a Gloss Pad to jewel my car as I have just about quit using waxes for just about anything. I do miss the zen relaxing part of waxing my car, but the durability of wax just leaves me cold. Mike Phillips uses Pinnacle jeweling wax on a Bentley with super soft paint and my first thought was “what a waste of time” as that car really needs to be coated for protection. I guess these “new” jeweling waxes give us more options to make our cars shine, but really it gives the marketers more profit on a “new” category of detailing products. The gloss measurements were the highest prior to adding the LSP, and after performing the wipedown with Gyeon Prep. The gloss meter will easily pick up any residuals left on the paint like post polish oils and LSP oils even though it looks like you`re getting a pretty clean wipedown. Measurements can be greatly impacted by just how well the product wipes cleanly from the paint when you buff it off. So the 101.5 from Menzerna isn`t a big surprise, it`s not the easiest finishing polish to wipe cleanly after polishing. The IPA wipedown cleans everything up nicely and the readings are significantly boosted as a result. McKee`s Jeweling Wax consistently scores pretty high and I believe this is a result of the abrasives. In this test it was difficult to get a clean wipedown after applying it but the N-914 easily removes any residuals. This is why we`re consistently getting a higher post wash reading, especially coming from a wash that is not designed to leave much (if anything) behind on the paint. 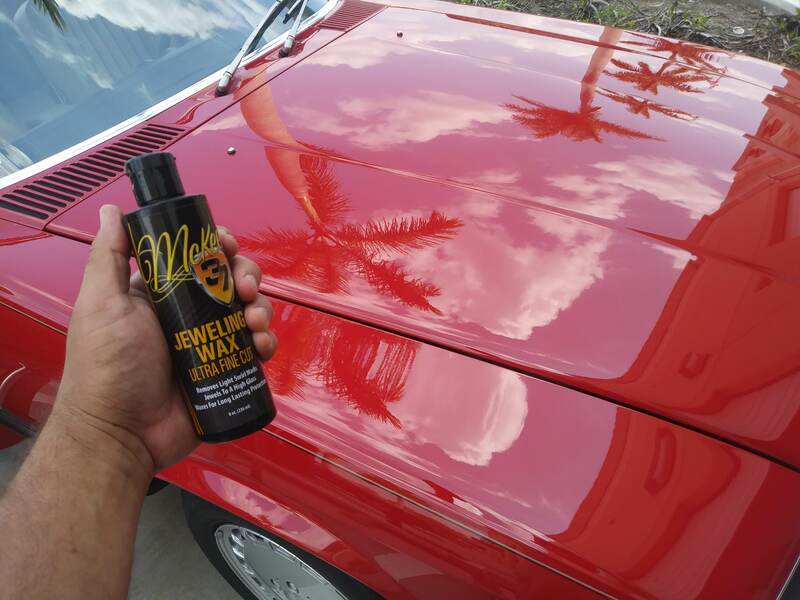 I applied Pinnacle Souveran Paste Wax (not the Jeweling Wax) right after the wash with N-914 with no other prep, it buffed off cleaner compared to Jeweling Wax but it was more difficult to find that peak 101.3 reading. It also benefits from the wash. These readings don`t surprise me too much. A good 3800 pass or five then Eraser wipe down just glows. I`m not familiar with N-914 but Uber Rinseless and ECH20 certainly amp up the gloss beyond what LSP can do, IME. Is the N-914, in your case, adding temporary gloss due to additives, or is it removing oils such that the meter can "see" the paint better? Forget where I saw it at. A test was done using a gloss meter, and pete`s 53 came out on top. It had a gloss reading of 105 . It was a U.K. Publication. On the test above I was using the 15mm long-throw DA with Menzerna 3800, this time I pulled out the 21mm DA, same black Buff and Shine pad. McKee`s 37 N-914 Rinseless Wash is not known to contain any polymers or gloss enhancers. Pete`s 53 is a great wax, buffed really clean from the paint, a little cleaner than Souveran this time. Still a good boost in readings after the N-914 wash but we`re already starting with a better base gloss measurement from the Menzerna 3800 with the 21mm DA this time around. I wouldn`t make the call based on this one test that the 21mm will produce more gloss than the 15mm throw on average. Interesting Loach. some of the differences you have measured are substantial enough to confirm two things: one: That the application of wax can have a muting effect on gloss. And two: the effect that a lot of us have reported that the first wash after a wax makes the car look glossier than before. The differences of 1 or 2 gloss units are doubtfully seen by the human eye. So, we can`t say for sure that Pete`s 53 is, visually, glossier than Sovereign. Neat stuff. Dang. Now I want a gloss meter. But Pete`s 53 is half the price of Souveran. I`ve said it before on here but gloss meters will eventually catch on broadly as a way to objectively compare products at some point in the future. Loach- Very interesting, thanks for doing all that and posting about your results. Kinda makes me think of how much better my wife`s car looks since I quit using M16/others on it. Regarding the gloss level of Souveran, I never thought of it as an extremely glossy wax to begin with. I use it on the Jag in part because the specific look I want on that paint is *NOT* extremely glossy. That`s the weakness of standard gloss meters in general. The wax and residuals/oils on the surface can have a negative impact on the readings because they can diffuse the light when it`s bounced off this surface, but in many cases people note they add to the depth of the paint which actually makes the surface look better to the naked eye. This gloss meter is only capable of measuring specular reflection, which is the measure of how much light is reflected when bounced off the surface at a specific angle, basically how shiny the paint is. Now the question for the warmer or depth based waxes is if this benefit only survives until the first wash, as the gloss meter will definitely pick up on a difference in appearance once the remaining oils are removed.